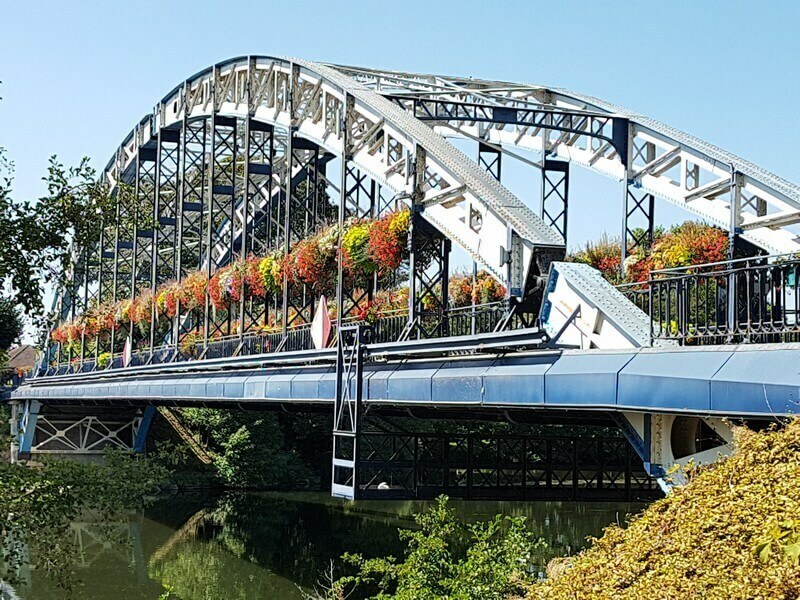 There is a very good reason why Northern Burgundy is referred to as “The Land of Good Living”, and if nothing else, once you complete this memorable boat and barge tour, we hope you understand why. 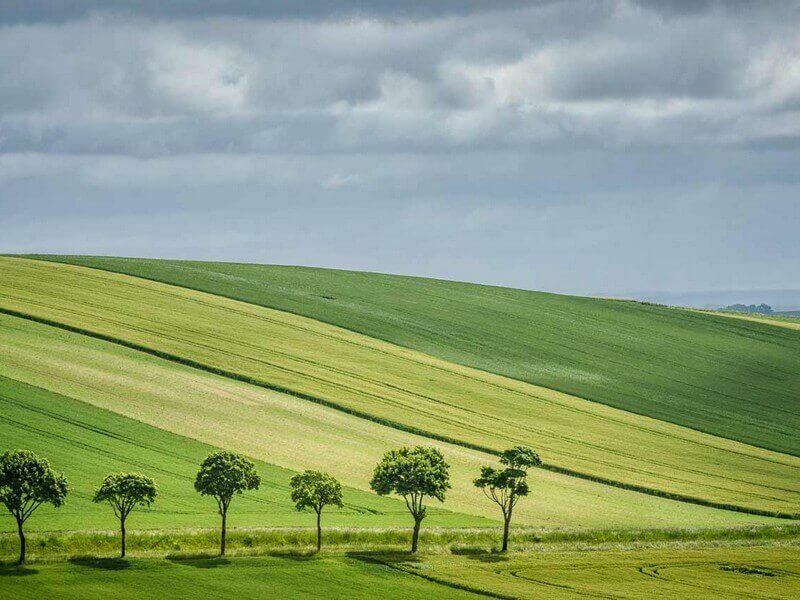 If you’ve never seen Northern Burgundy you are in for a sensual overload of divinely beautiful countryside, ancient medieval villages, serene, meandering rivers and of course, some of the best wines, cheeses, honey and ciders the world you will have ever tasted! 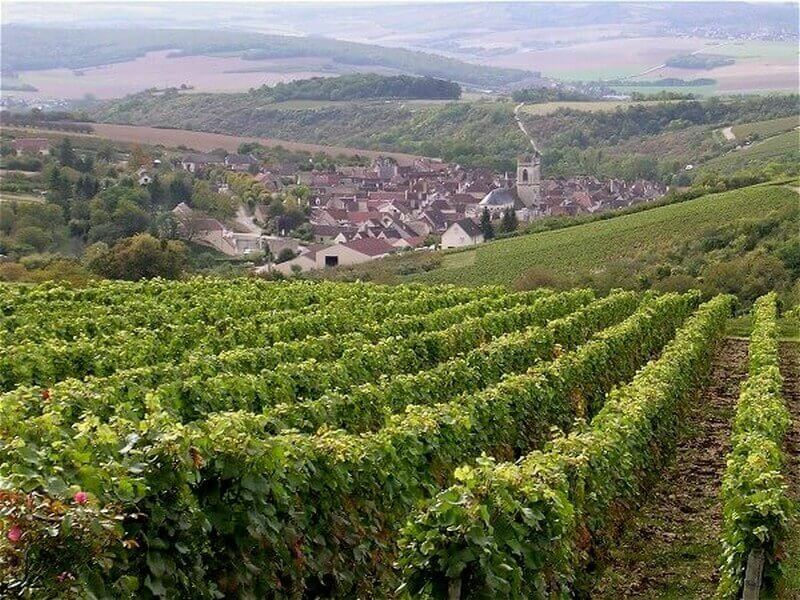 Burgundy is known throughout the world for its laid-back pace of life, friendliness and mild climate. Both the cultural experiences of visiting wonders such as the gothic cathedral of Sens or the cities of art and culture of Auxerre and Joigny, and the biking itself which alternates between easy stretches of free-wheeling alongside the river Yonne and more challenging uphill sections that lead to spectacular views, will leave you feeling enriched, enlightened and recharged. Our epic tour of Burgundy begins with embarkation and check-in at 2pm. Your captain, crew and tour leader will give you a warm welcome followed by a bike fitting. After a delicious dinner onboard, there is ample time to take a starlit stroll through the beautiful river town of Auxerre with her majestic church spires, streets lined with 16th century timber houses and cathedral of Saint-Etienne, a true masterpiece of Gothic art. 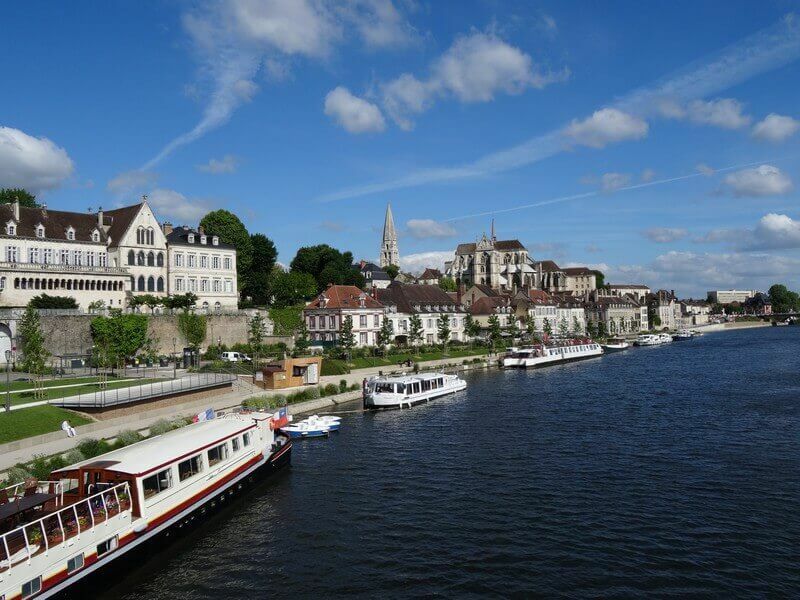 Today you have the option to either stay, relax and take in more of the sights of Auxerre, or begin your cycling adventure with your guide leading you along the Yonne river en route to “Caves be Bailly”. 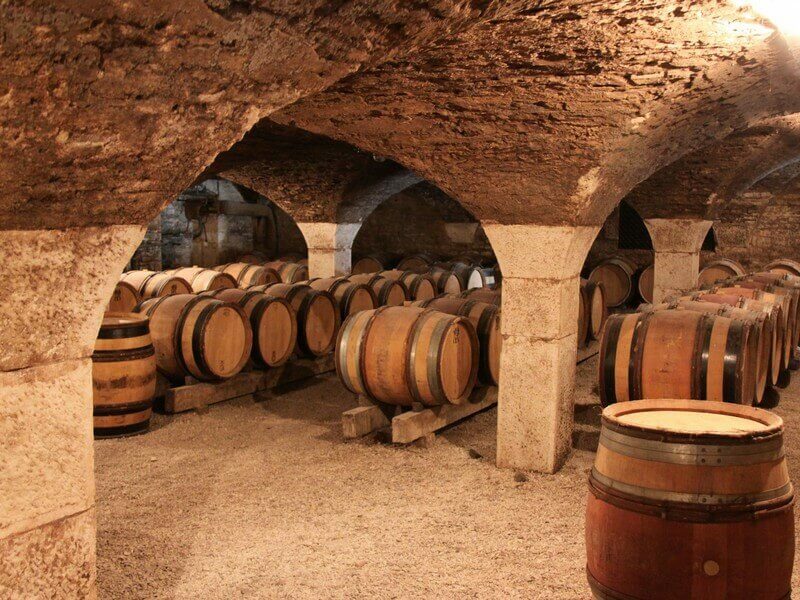 This vineyard is famous for its sparkling Cremant de Bourgogne and limestone caves. The nearby vineyards of St Bris and Irancy are also well worth a visit, as are the paintings of George Hosotte in the Chapelle de Bailly. Today we strike out north, cycling through the Yonne river valley toward Joigny. 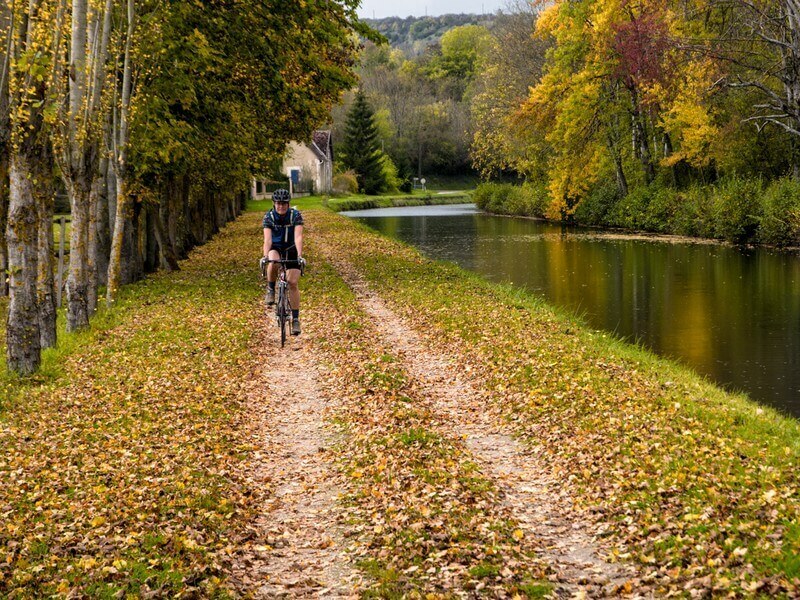 If you choose the longer cycling route, you’ll get to see the charming countryside of Brienon-sur Armencon from where you’ll follow the beautiful Burgundy canal to Migennes where the Burgundy canal crosses the river Yonne and where you’ll rejoin your ship for a relaxed afternoon sail to Joigny, a picturesque little town that has a long and storied wine history as well as several historical monuments, ancient churches and townhouses with carved renaissance facades from the 16th and 17th centuries. What better way to start the day than with a loop through the local vineyards for a tasting of some of Burgundy’s finest wines? You’ll return to Joigny for lunch, after which you have the option to either hop on the ship for a leisurely sail to Villeneuve sur Yonne or jump back in the saddle for an afternoon ride to the town of Saint-Julien-du-Sault where you can visit the 13th century Saint-Pierre church with its magnificent stained-glass windows. We dock for the night in the lovely, lesser-known French town of Villeneuve where you are free to explore the medieval gate towers and romantic string of gardens as the sun sets over the countryside. 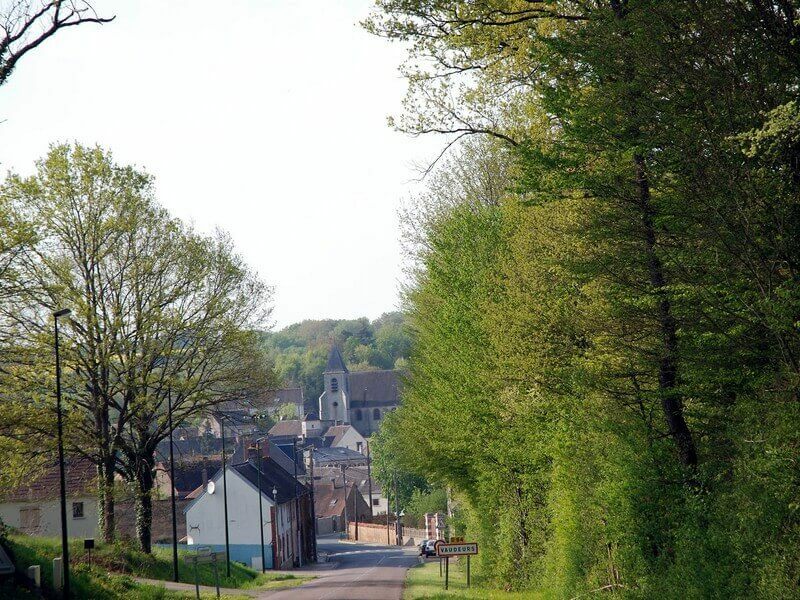 Day five also offers two cycling options – the short option follows the river Yonne, while the longer option takes you into the hills for a rewarding taste of the fine cider produced at the museum ‘de Pomme et de cidre’. 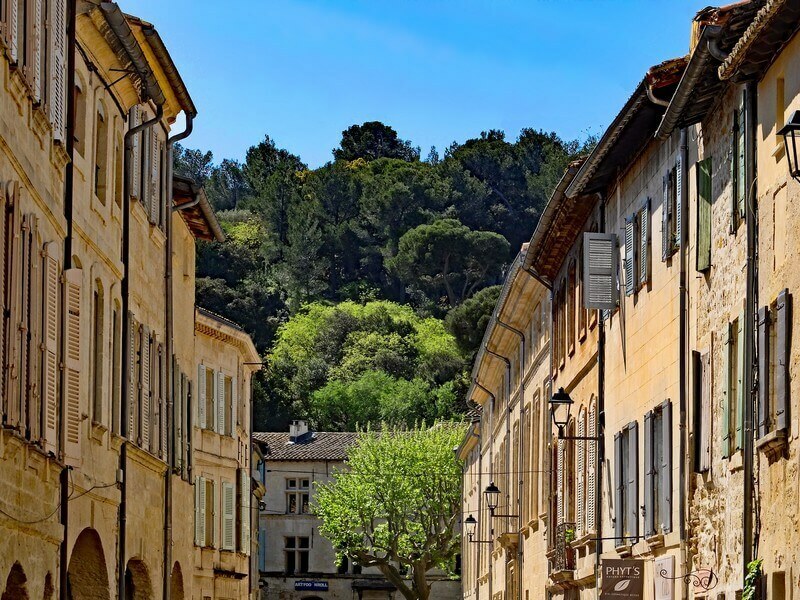 Our next stop is Sens, one of the oldest towns in France where you’ll visit the first of the greater gothic cathedrals in France, Cathedral Saint-Etienne. There will be plenty of time afterward to shop, stroll through the marketplace or wander around town to acquaint yourself with the many restaurants Sens has to offer as today there is no dinner onboard. If you decide to brave the longer cycle route on day six, it leads to a local honey producer where you can sample their delicious wild honey. 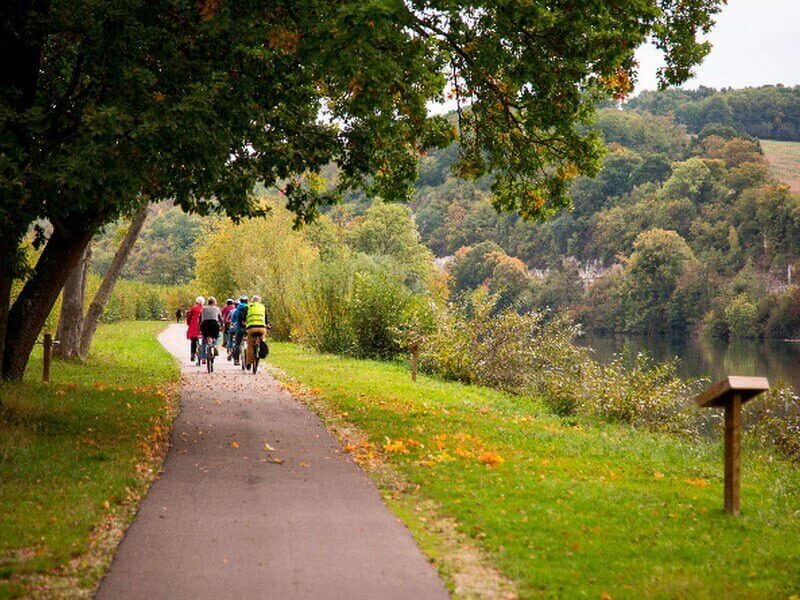 However, the shorter option affords you more time to explore Sens at your leisure before you cycle through to Pont-sur-Yonne, a charming riverside town. 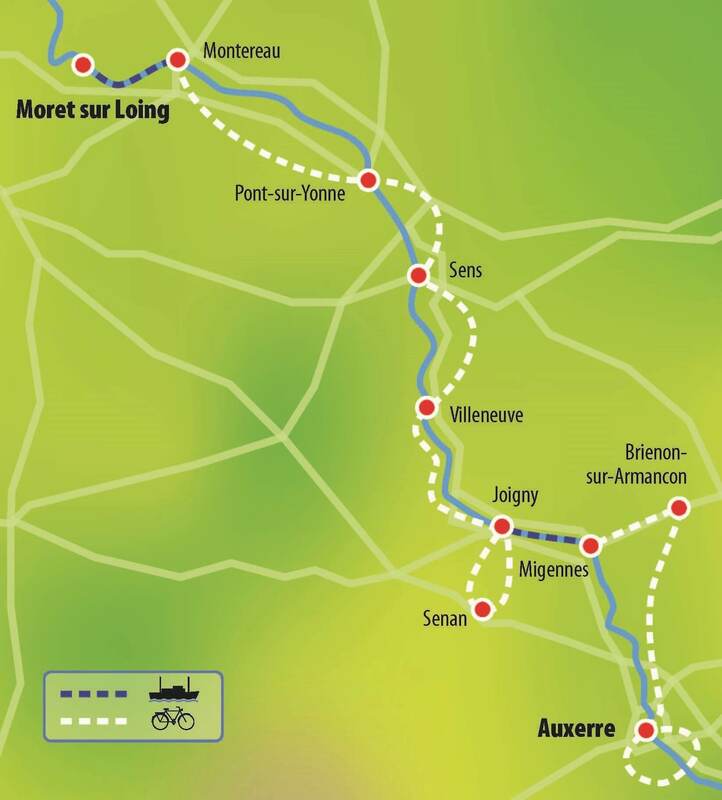 On our final day’s biking, we’ll visit Montereau-fault-Yonne, a town situated at the confluence of the Yonne and Seine rivers. 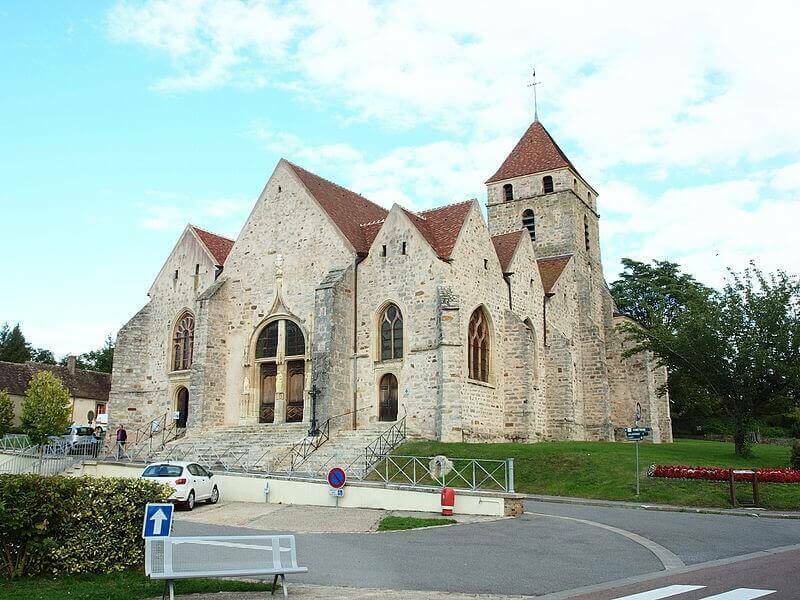 Here, the thousand-year-old Notre-Dame-et-Saint-Loup collegiate church is well worth a visit. 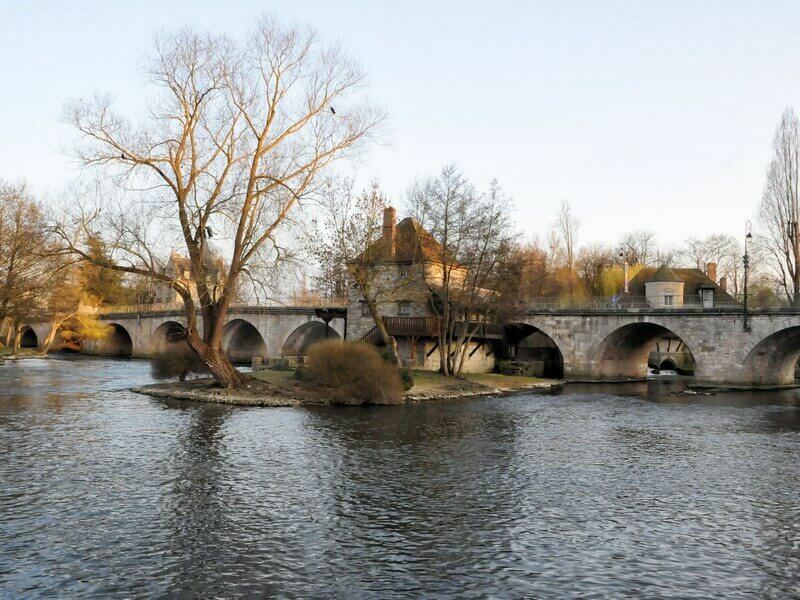 At Montereau we hop back on board the ship for a dinner cruise to our final destination, the charming medieval fortified town of Moret-sur-Loing where the famous painter Sisley drew inspiration for his work. You bid your captain, crew, tour guide and fellow passengers a fond farewell as we enjoy one last breakfast together while disembarkation continues until 9:30am. The first day of your tour begins with embarkation and check-in at 2 p.m. After a warm welcome by the captain, crew and tour leader, you’ll be fitted with a bike for the tour. 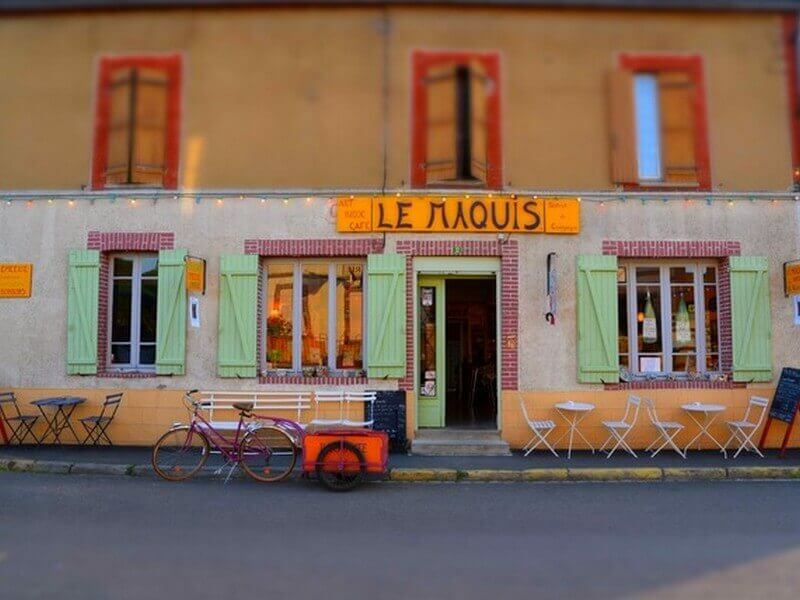 Dinner will be served onboard, after which you can enjoy a moonlit stroll through Moret-sur-Loing, a charming medieval fortified town, situated on the banks of the Loing, where the painter Sisley found inspiration for his beautiful impressionist paintings. Day two begins with a leisurely breakfast while sailing to the town of Montereau-fault-Yonne, situated at the confluence of the Yonne and the Seine rivers. 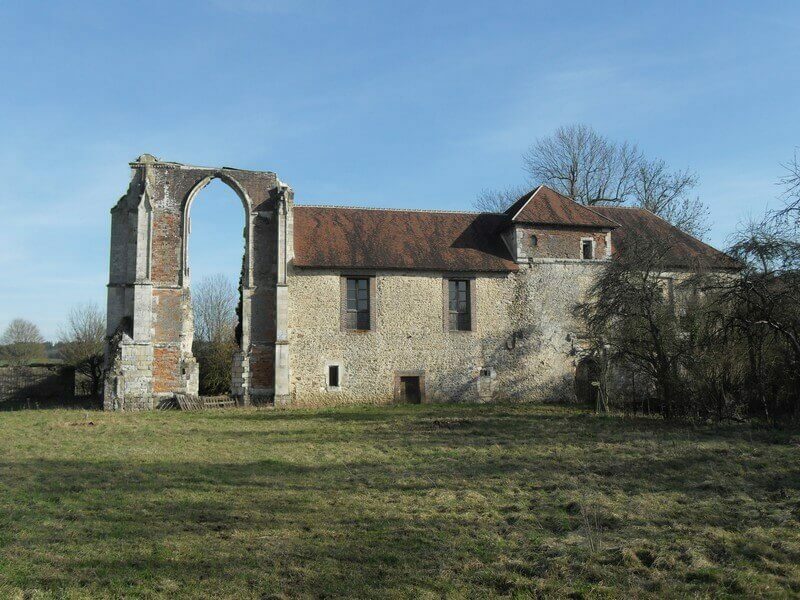 In Montereau you’ll have an opportunity to visit the Notre-Dame-et-Saint-Loup collegiate church. 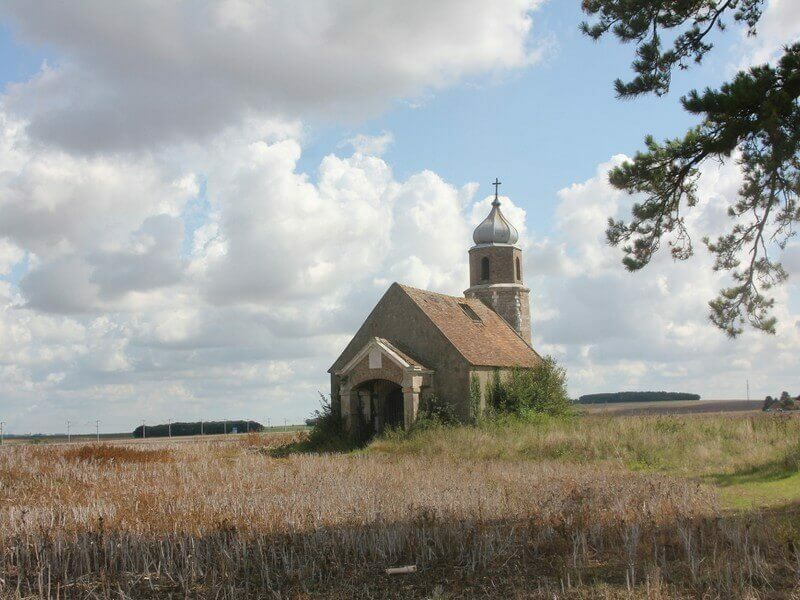 Built between the 12th and 14th centuries, this church has been officially classified as a Historic Monument. From Montereau you will follow the canals of the river Yonne to Pont-sur-Yonne, a quaint, friendly town where we will dock for the night. Today you have the option to follow the river valley to the town of Sens or take a longer ride into the countryside and visit a local honey producer. Sens is one of the oldest towns in France, here you’ll visit the first of the greater gothic cathedrals in France, Cathedral Saint-Etienne. There will be plenty of time afterward to shop, stroll through the marketplace or wander around town. Near the town you’ll find the 10-hectare Parc du moulin a Tan, through which the Vanne and the Lingue run. The Parc du moulin a Tan is a precursor of the town’s project for a green belt, which should ultimately go right around Sens. It’s named after an obscure type of mill that dates back to 1887 and was used to grind oak bark to make tanbark, a powder used in leather tanning. The Parc du moulin a Tan includes a rose garden, an animal enclosure, an arboretum, and a playground. Once more, your day begins with two cycling options. The shorter one stays closer to the river, where the longer one takes you through the hills to the museum ‘de Pomme et de cidre’ where you’ll be rewarded with a taste of the fine cider they produce here. We dock for the night in the lovely, lesser-known French town of Villeneuve where you are free to explore the medieval gate towers and romantic string of gardens as the sun sets over the countryside. 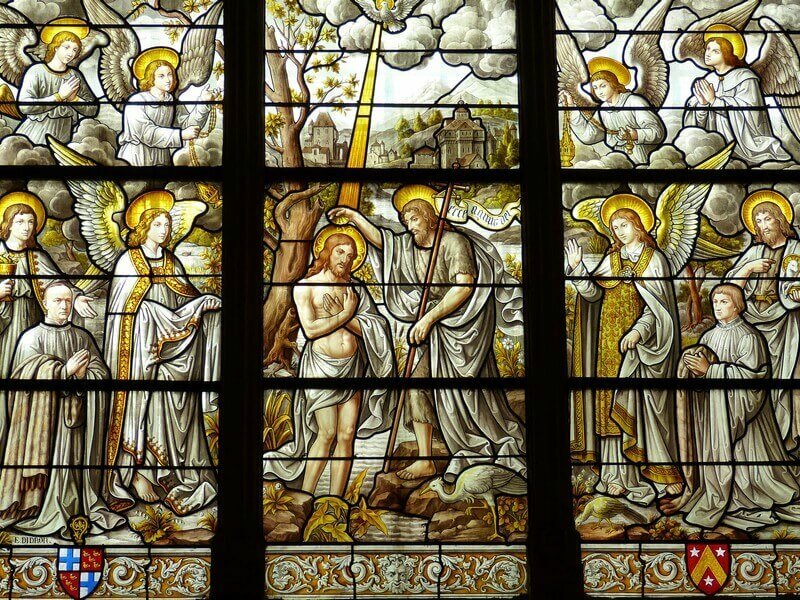 Today you’ll start the morning with a beautiful bike tour to the town of Saint-Julien-du-Sault where you can visit the 13th century Saint-Pierre church with its magnificent stained-glass windows. You’ll then continue to Joigny where you’ll follow a lazy loop through the local vineyards in the afternoon sunshine. Then (one of the highlights of the tour for wine-lovers!) 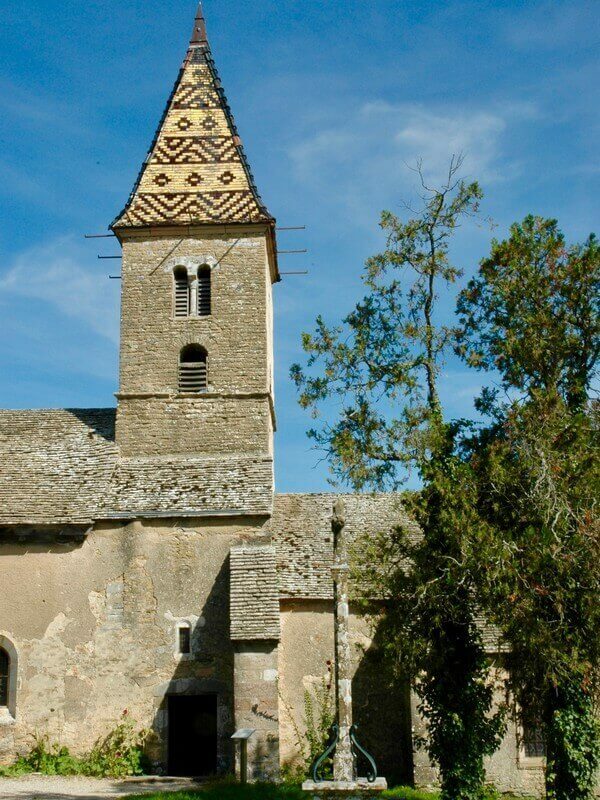 the tour leader will show you some places to taste the fine Burgundy wines. 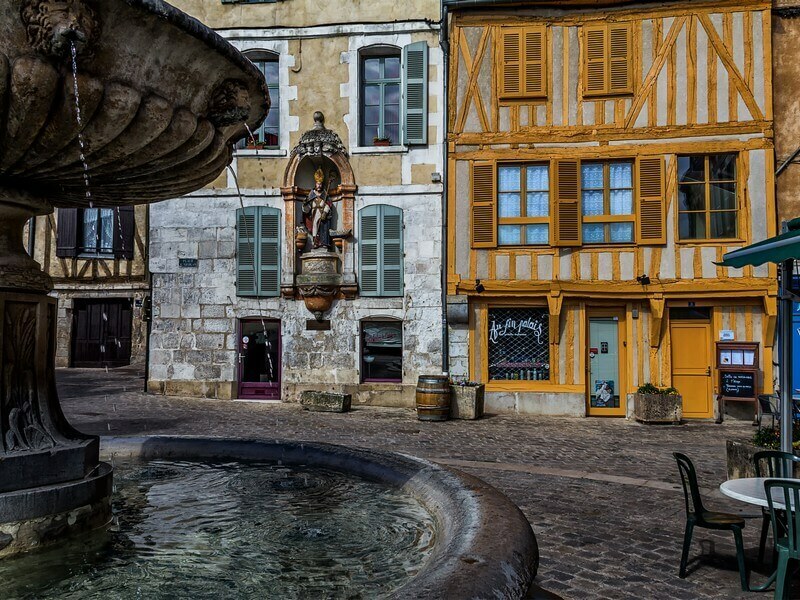 Joigny, a picturesque little town with a very long and successful wine history, has several sights worth visiting, including numerous historical monuments, unique townhouses from the 16th-17th centuries, with carved renaissance facades, and ancient churches. Another leisurely breakfast aboard as we sail to Migennes at the junction of the Burgundy canal, once a center of shipping industry. 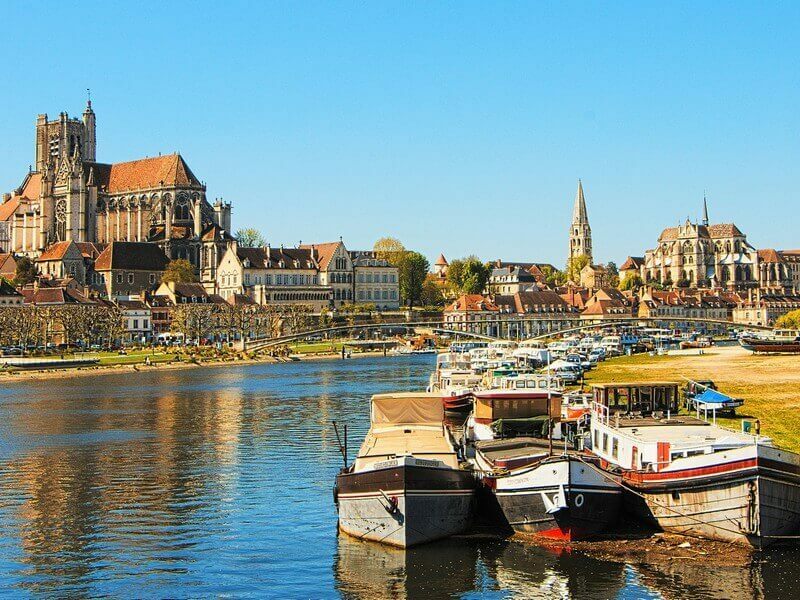 You’ll hop back on your bike at Migennes to follow the beautiful Burgundy canal as you head south to Auxerre with her majestic church spires, streets lined with 16th century timber houses and cathedral of Saint-Etienne, a true masterpiece of Gothic art. You can also stroll along the old port or visit the 15th century clock tower. Today there is no dinner on board, so you are free to choose one of the local restaurants for dinner. On day seven of your tour, you are spoilt for choice when it comes to deciding how to spend your day. If you’d like to spend a lazy day strolling around Auxerre, feel free to enjoy this beautiful city however you choose! 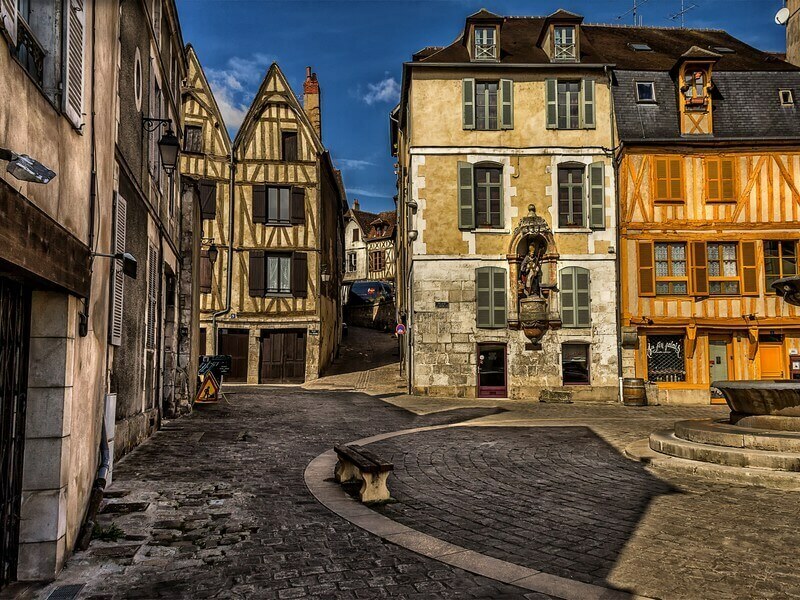 If you’re itching to get back in the saddle, then explore the area of Auxerre together with your guide. 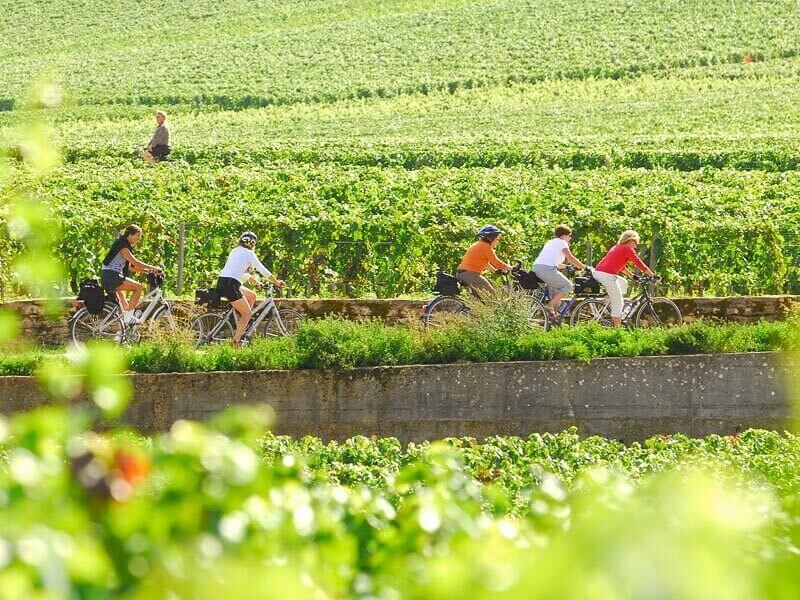 Cycle along the Yonne to visit ‘Caves be Bailly’, a vineyard is famous for its sparkling Cremant de Bourgogne and limestone caves. The nearby vineyards of St Bris and Irancy are also well worth a visit, as are the paintings of George Hosotte in the Chapelle de Bailly. The final day of this memorable trip begins with a farewell breakfast onboard after which disembarkation continues until 9:30am. Rental E-Bike (incl. helmet and water bottle): €185 per period (only on request, limited number of e-bikes available, early bookings strongly recommended. Transfer between Paris and Moret: There is a continuous train service between Paris (Gare de Lyon) and Moret. Trains depart regularly and the trip takes approx. 45 min and costs approx. 20 euros. From the Gare de Lyon in Paris, a bus service is available every 30 minutes, Le Bus Direct nr. 4 (shuttle) to the airport Charles de Gaulle, which will bring you there in approx. 50 minutes. € 22,– (2018). Transfer between Paris and Auxerre: There is a continuous train service between Paris (Gare de Bercy) and Auxerre. Trains depart regularly and the trip takes approx. 2 hours and costs approx. € 30. From the Gare de Lyon (close to Bercy) in Paris, a bus service is available every 30 minutes, Le Bus Direct nr. 4 (shuttle) to the airport Charles de Gaulle, which will bring you there in approx. 50 minutes. € 22,– (2018). Please visit one of the following websites for timetables, tickets or more information www.goeuro.co.uk or www.trainline.eu. The Zwaantje, ‘little swan’, is the classic ship of captain Martijn and his spouse Marjorie. On the lower deck are 12 cabins: 10 twins and 2 doubles. All with a bathroom, a window (can open only in the double cabins) and individual air conditioning. On the main deck you can have a seat and a refreshing drink in the lounge corner of the cozy salon with its large panoramic windows. Or enjoy your breakfast and delicious three course dinner in the adjacent restaurant area. And with a little bit of sunshine you should take a seat on the sun deck. Our bikes are modern unisex bikes with 21 gears, an easy and low entry, two handbrakes, a lock and pannier bag. The E-Bike has hand breaks only, 3 gears and support levels, a lock and pannier bag. (limited available, only on request). Tours in The Netherlands/Belgium: Bicycle rental is optional. You can bring your own bike, but only after it has been previously registered and confirmed. Daily the crew brings your bike off and on board. Small scratches and damages on the bikes can’t be avoided. The crew nor the tour operator can be held responsible for that. The bicycle shed is not covered. Please bring enough repair material/repair set with you. 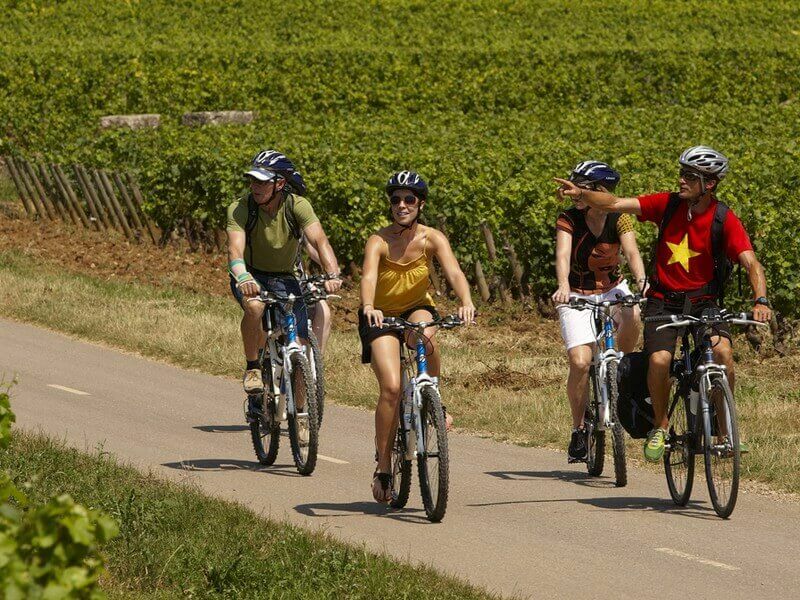 Tours in France: During this tour you cannot bring your own bike. Exceptions are made for special bikes, but only after they have been previously registered and confirmed. Children till 12 yrs. are obligated to wear a bike helmet.